Description: In autumn 1805,a group of ragged strangers staggered into a Nez Perce Indian camp on the Clearwater River in what is now northern Idaho. The natives discussed killing the starving newcomers and taking the wonderous treasures they carried in their packs. Instead, they heeded an old woman who said, "Do Them No Harm!" 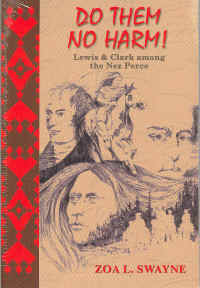 That decision marked the beginning of a unique friendship between the Nez Perce and the members of the Lewis and Clark Expedition. Zoa Swayne spent years writing down the events of 1805, 1806 as remembered by Nez Perce storytellers then combined them with entries from the journals of the explorers to create a fascinating story about an alliance that changed American history.